This reading group guide for The Beautiful Daughters includes an introduction, discussion questions, and ideas for enhancing your book club. The suggested questions are intended to help your reading group find new and interesting angles and topics for your discussion. We hope that these ideas will enrich your conversation and increase your enjoyment of the book. From the author of Sleeping in Eden comes a gripping new novel about two former best friends and the secrets they can’t escape. Now, five years later, both are convinced nothing could ever coax them out of the worlds in which they’ve been living. But unexpected news from home soon pulls Adri and Harper back together, and the two cannot avoid facing their memories and guilt head-on. As they are pulled back into the tangle of their fractured relationships and the mystery of Piperhall, the sprawling estate where their lives first began to unravel, secrets and lies behind the tragic accident are laid bare. The former best friends are forced to come to terms with their shared past and search for the beauty in each other while mending the brokenness in themselves. 1. Why do you think the author chose to include an anonymous prologue? Who do you think wrote it: Adri or Harper? Does it matter? How does this prologue set the tone for the rest of the novel? 2. Discuss Adri and Harper’s first meeting when Adri is moving into her college dorm room. What things can you learn about Adri and Harper from this encounter? To what extent does their initial interaction anticipate the nature of their relationship? 3. Piperhall isn’t just a part of the setting, it almost becomes a character in The Beautiful Daughters. What role does the Galloway estate play in the unfolding of events in the book? 4. A number of characters (Adri, Harper, Victoria) carry secrets that eventually come to light. Is there catharsis once they’re able to unload the truth? Did it do them any good? Was the keeping of those secrets forgivable—why or why not? 5. “When everything was said and done, Adri still loved Harper. But she hated her, too.” (p. 28) How is this possible? Can you relate to the sometimes-fine line between love and hate? 6. The novel explores many themes (guilt, redemption, friendship, family). Which do you think is most important, and why? 7. Discuss Adri’s relationships with Will and her father. How do those two men in her life affect the decisions she makes? How does Caleb finally break down some of her walls? 8. Adri and Harper dealt with their guilt over David’s death in very different (and rather extreme) ways. Discuss how they coped with their feelings of loss and remorse. How could the story have changed if they had handled the situation differently? 9. Both Adri and Harper struggle with the idea of forgiveness and being forgiven. What do you think defines forgiveness? What does forgiveness mean to you? 10. At the heart of The Beautiful Daughters is a grave misunderstanding. Both Adri and Harper feel responsible for David’s death. Which version of the story do you believe? Or do you think there is a third interpretation? 11. The novel deals with some difficult subjects, including death and abuse. What challenges do you think the author faced when choosing how to represent those dark themes? 12. What does friendship mean to you? What could cause a friendship to fall apart? 13. The epigraph at the beginning of the book declares that: “hope has two beautiful daughters . . . anger and courage.” Do you think Adri and Harper embody these characteristics? How? 14. It’s obvious that Harper’s situation with Sawyer is much more sinister than she is willing to admit. What do you think is the nature of their “relationship?” Do you think Harper is a victim of human trafficking? Why or why not? 15. Both Adri and Harper loved David—or thought that they did. Were they deluding themselves? What was the allure of David for both of these women? 16. As the novel progresses, David’s destructive behavior becomes increasingly ruthless as he uses and abuses both Adri and Harper. What role do you think David played in the circumstances surrounding his own death? Is he in any way culpable for what happened to him? Why or why not? 1. When Nicole Baart’s debut novel, After the Leaves Fall, was published, she won critical acclaim for her “evocative and beautiful” writing (Romantic Times Book Reviews). Publishers Weekly called the novel “a promising debut” praising the novel as “a welcome addition to inspirational fiction.” Read After the Leaves Fall with your book club and compare the two novels. Has Baart’s writing style changed since the release of her debut? How? Were there similarities between the two books? Discuss them with your book club. 2. To gain insight into Baart’s writing, watch this video where she discusses why she writes: http://vimeo.com/32239024. 3. To learn more about Nicole Baart and her other books, read reviews of her works, and read her blog, visit her official site at http://www.nicolebaart.com/. "A meditation on friendship, betrayal and redemption, The Beautiful Daughters is the kind of story that grabs hold and doesn't let go until the final, moving page. Baart spins together multiple storylines with masterful skill, and her richly realized characters stay with you long after you've finished reading." "Baart expertly unravels the backstory of her intriguing characters, capturing the nuances of both life-tested relationships and the intense passion of first love. Ripe with complex emotion and vivid prose, this story sticks around long after the last page is turned." "Baart’s eloquent prose draws the reader into the tragic tale. At times a love story, other times a mystery, this is overall a very purposeful piece of fiction." 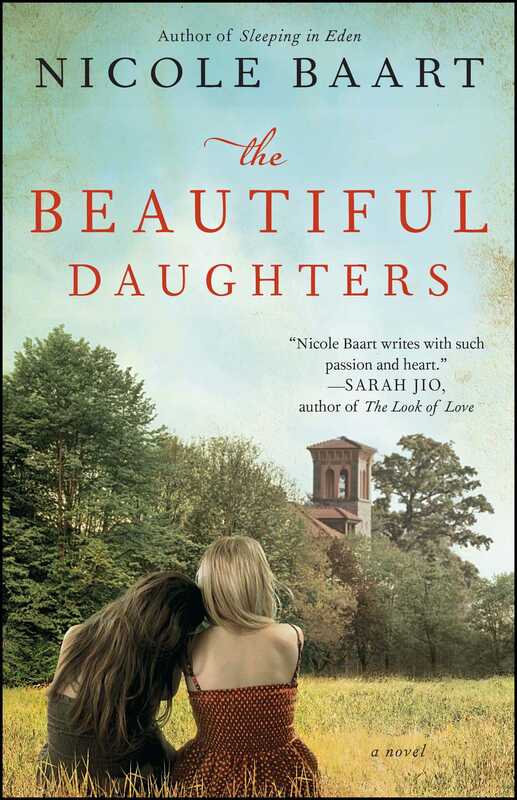 "Nicole Baart writes like a dream, and she gives us a story that is part murder mystery, part sensitive exploration of our human connections: the ties between parent and child, husband and wife; the tug of the past; and the blurry, often baffling border between friendship and love." "Sleeping in Eden is intense and absorbing from the very first page. Written in lovely prose, two seemingly different storylines collide in a shocking conclusion." "Baart's beautifully layered story of one man's journey to repair his wounded marriage, and the unsolved crime that may be the key to its healing, takes readers on a gripping ride. At turns chillingly suspenseful and achingly tender, Sleeping in Eden is exactly the sort of novel every reader hopes to find when they crack the spine of a new book. Baart's characters are richly drawn and utterly compelling; I was hooked from page one."